Whether it's snowy, rainy, or sunny, readers can explore the natural world with Maisy and find out how wonderful weather can be! 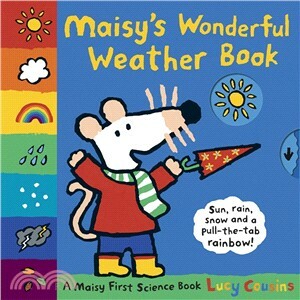 What's the weather, Maisy? It's sunny — hooray! It's windy — hooray! It's raining — hooray, hooray! Whatever the weather, Maisy knows how to make the best of the day. Little fans will be proud to help with the forecast by pulling the tabs and turning the wheels to make the rain come down, the snow fall, the lightning flash, and even a rainbow appear!